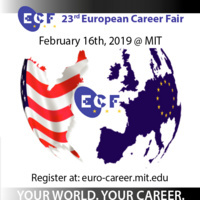 The Annual MIT European Career Fair (ECF) returns for its 23rd edition on February 16th, 2019. The ECF is the largest European-focused career fair in the country, with close to 100 companies/institutions and 3000 candidates attending every year. It is open to all university students and young professionals who are interested in working in Europe, or for European companies present in the US. It will take place from 9am to 4pm at the Johnson Athletic Center (Building W34) at MIT in Cambridge, MA. Besides talking with company representatives, you will also get the chance to attend information sessions, get advice on your resume, and obtain interviews! REGISTER NOW and drop your CV at euro-career.mit.edu!